Caption slip reads: "Future. Photographer: Olmo. Date: 1957-11-25. Reporter: Sid Bernstein. Assignment: Nisei Boy Scouts feature. Special Instructions: Note, negatives to Erwin Baker. 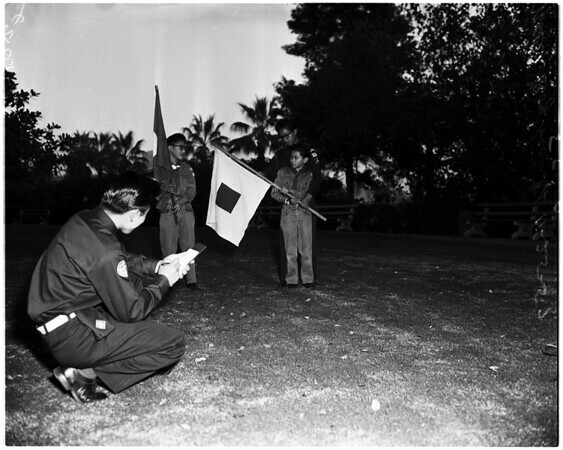 29/30: left to right rear: Scouts Asao Tokunaga, 15, 3021 East 2nd Street, and Dennis Inouya, 13, 208 South Alma Ave. send morse code. Foreground left to right: Explorer scouts Ronald Yamada, 15, 456 South Rowan Ave., and Eugene Inouya, 16, 208 South Alma Ave. receive. 33/34: left to right rear: Asao Tokunaga and Dennis Inouya, get signaling instructions from Eugene Inouya front, receiving, Ronald Yamada. All scouts from Troop 365 sponsored by Free Methodist Church of Los Angeles".